Arkhiv Iugo-Zapadnoi Rossii (Archive of Southwestern Russia). Published by the Kyiv Archeographic Commission in Kyiv in 1859–1914. The Arkhiv is divided into eight parts or series. The first part consists of twelve volumes of materials on the history of the church, edited by Orest Levytsky, Teofan Lebedyntsev, Serhii Ternovsky, Stepan Golubev, and Volodymyr Antonovych. The second part consists of eight volumes of documents pertaining to the nobility's self-rule and was edited by Mykola Ivanyshev, Ivan Kamanin, and Mykola V. Storozhenko (publ 1861–1910). The third part consists of six volumes of materials on the Cossacks and the Haidamaka uprisings, edited by V. Antonovych, I. Kamanin, and Nykandr Molchanovsky (publ 1863–1914). 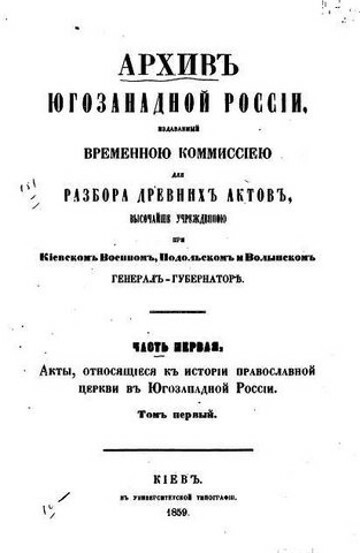 The fourth part, edited by V. Antonovych, is one volume (1867) of documents on the family histories of the nobility. 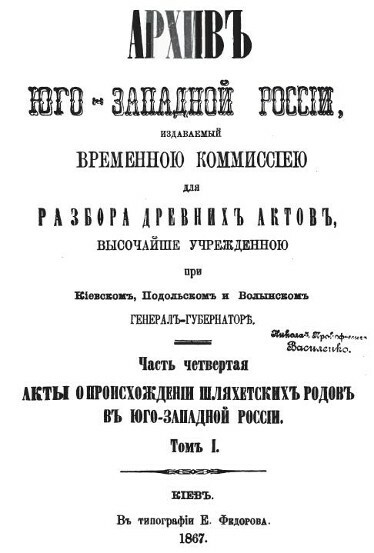 The fifth part deals with towns and is in two volumes (1869–91), edited by V. Antonovych and I. Kamanin. The sixth part consists of two volumes (1870–6) of materials about the peasantry, edited by V. Antonovych and Ivan Novytsky. The seventh part deals with the colonization of Right-Bank Ukraine up to the end of the 17th century and consists of three volumes (1886–1905), edited by Mikhail Vladimirsky-Budanov. The eighth part consists of six volumes (1893–1911) of materials on the administration and internal affairs, edited by Mykhailo Hrushevsky, O. Levytsky, M. Vladimirsky-Budanov, and Mytrofan Dovnar-Zapolsky. I. Novytsky prepared an index of personal names (1878) and an index of geographical names (1883).